I know. I failed in my aim of getting four reviews completed in a week. What can I say? Life, and turning 30 got in the way. Well that and the annual judging day at the World Scotch Pie Championships. This year I was let loose on the hot savoury section a veritable smorgasbord of pastries of all kinds, shapes and sizes. Whilst I was slightly disappointed not to be sticking to my football based roots it did ensure that my taste buds were taken to some glorious new places, both good and bad. Confidentiality prevents me going into any further detail just now but after some fairly heated debate I’m quite happy with our hot savoury champion and hopefully you agree when the winners are revealed on the 13th January 2016. But for now it’s back to those aforementioned roots and to where it all started with a Scottish Junior football scotch pie from Benburb based in Govan a short walk from Iborx the home of one of Scotland’s biggest clubs Rangers. (I’ll leave it to you to debate if you believe they are the biggest or not, no time for that kind of chat here). 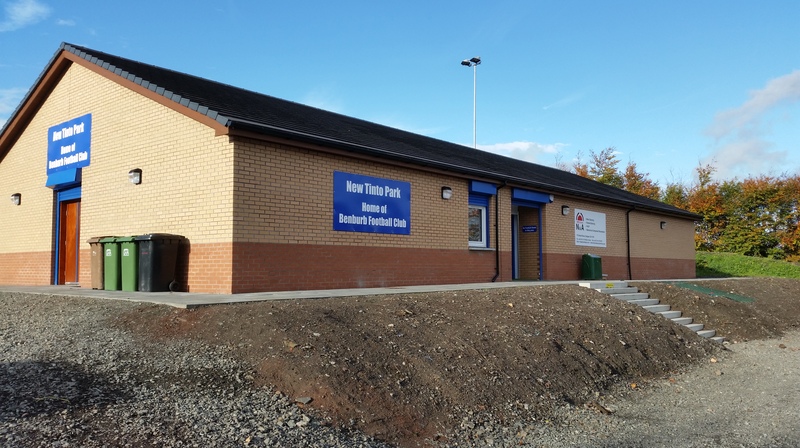 Having to replace the steep banks of ‘Old’ Tinto Park’ is no mean feat in this new all weather era. Price: At £1.50 there’s no shame in admitting that I was a little taken aback by the price of this pastry. 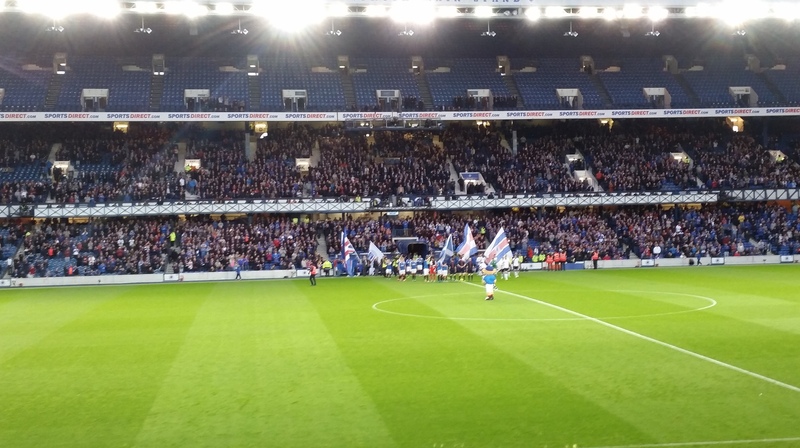 Sure it’s nowhere near the high £2 figures found at the top of the Scottish game but it is also a good sight more expensive than the litany of pound priced pies found throughout the junior game. It’s not a grumble, and I was still more than happy to pay it, but just a mere an observation. Presentation: Free from the shackles of a tin foil cases this pie was presented on a couple of sheets of plain white kitchen roll. Meatiness: This was a squat little pie that had a nice filling but that didn’t really blow me away. The meat was well seasoned and proportional when compared with the volume of the pastry but I felt it lacked some zing. Usually I have a fair bit to sat about a pie filling but my lack of words here should not be construed as a lack of care but more a feeling of ‘meh’. It was nice just not very memorable. Pastry: The Pastry was golden around the sides, if a little blackened on top whilst being very well fired on the bottom, this juxtaposed with a strangely chewy top, almost perogi-like in texture, made for strange and sometimes awkward eating experience with my pie juggling skills out in full force. Brown Sauce: Once a request was made, as initially there was no sauces of any kind on display, a bottle of HP was forthcoming. Overall: A little pricey, but a perfectly serviceable pie. Gravy Factor: Have to give this a gravy factor of Bog Standard Bisto. Maybe I’ve been a little harsh on this pie with it having the misfortune of being the first pastry to be reviewed since judging day but at the end of the day it was still a tasty footballing treat. Better than any cheeseburger, chips or roll and sausage you can put before me on the terraces. My next review comes from Pollok, my local team, and a very special limited edition steak pie. This entry was posted in Football Pies, Junior Pies, Sporting Pies, The Life of Pie and tagged Benburb, Football, Gravy, Juniors, Meat, meat filled pastries, mince, pastry, Pie, pollok, scone thistle, scotch, scottish junior cup, world scotch pie championships. To really focus on writing a book something you need is time. That, or the ability to generate time by re-organising your life. Unfortunately time is something that is in short supply for me at the moment, well I say unfortunately but I don’t mean it. In the last few months I have been buzzing about visiting new places, working and generally having a good time all the while trying to get my life going where I want it to go. I’m pretty confident I’m going about things in the right way a sure sign of which can be identified in the fact that I have totally lost track of the plot lines and character intricacies found down Hollyoaks way. Anyway the point is I’m aware the book isn’t coming along at the pace I first predicted but I can happily justify it with everything else that is going on. Which nicely brings me to this years World Pie Championship Judging Day. Once again I have the honour of being asked to judge at the championships and I want to do my bit to make sure the football category is the biggest one yet! So if you think you have the best pie in town details on how to enter can be found at the following link: http://scottishbakers.org/news/search-has-started-2016-world-scotch-pie-champion. Last year there were 49 pies to judge and I would love to get my chops around some more. However until then I still have a website to run so without further ado, let’s rate some pie! Price: As can be seen from the table below the Seasonal Pie (remembering at this point of my purchasing experience this pastry could have had anything from caviar to a combine harvester inside of it) was a whopping £3.40. The highest priced pie consumed in Scotland to date and a full 20p more expensive than the previous holder of this title The Queens Park Chicken & Tarragon Pie. 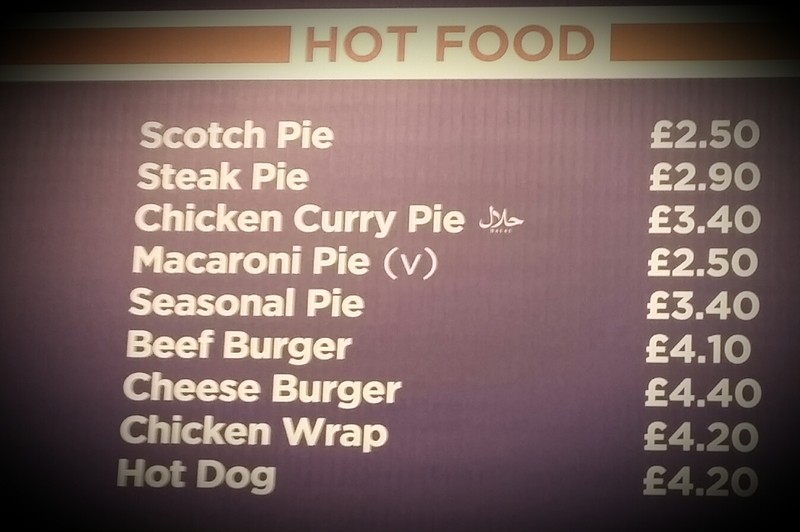 This pie cost the equivalent of 3 junior scotch pies or two and a bit luxury offerings from the same level. Expensive. Pies. Still cheaper than a burger or a CHICKEN WRAP!?. 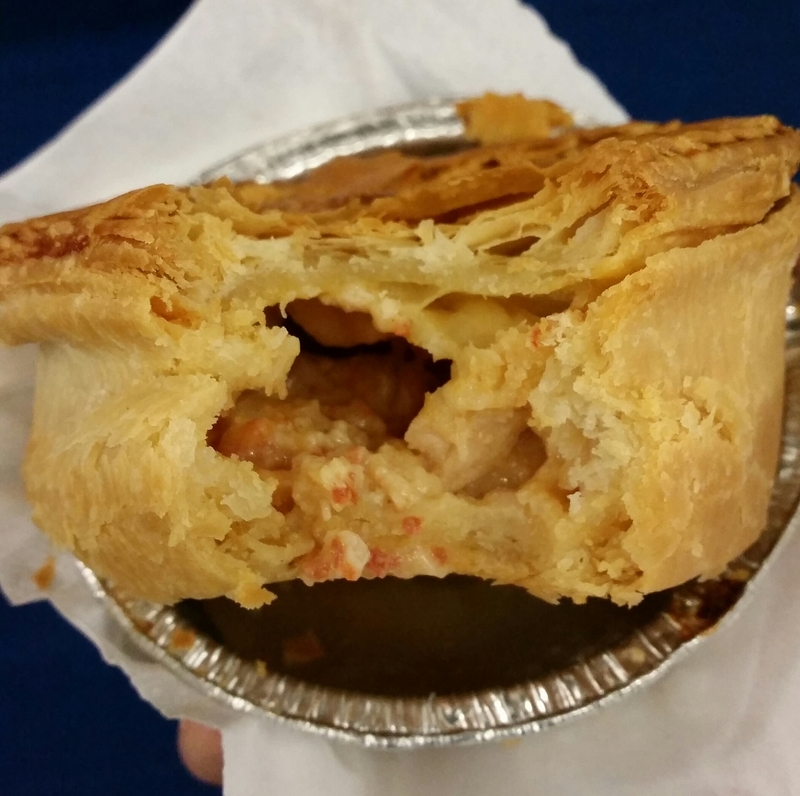 Presentation: As is often found in senior Scottish football this pie was presented in a large aluminium foil container with the option of a small white napkin from the self-service dispenser on the counter. The kind of size where really you need 2 or 3 to get full mop-up-ability. Let’s be honest, that’s not looking very bonny. Meatiness: On the discovery that this was indeed a Chicken & Ham I got quite excited. I enjoy a chicken pie, in fact I’m still partial to a Roll and Chicken Bake often purchased from a well-known high street bakers and ham, of any kind, adds a salty meatiness to pretty much anything that I never fail to enjoy. I took a bite and was instantly disappointed. It was not filled with generously portioned large chunks of ham and chicken wrapped in a luscious creamy gravy. No, instead there were, from what I could count on my tongue, 4 pieces of smallish chicken and a half-dozen or so small cubes of ham lacking in both texture and flavour. Then there was the gravy a claggy mush of water and I assume flour again lacking in flavour. I don’t often go for the jugular in these reviews as I like to find the good in every pie but this one really annoyed me. It wasn’t even well filled look at the gap there, LOOK AT IT! You could fit in another pie it’s so cavernous! This (for a premium price remember) is simply not good enough. Pastry: The pastry was short crust on the sides and puff on the top of which I had no real issues. It would have greatly benefited from a proper gravy to help moisten it a bit as during consumption it did become dry but in honesty the pastry was not the issue here. Brown Sauce: With it being a luxury pie I didn’t use any brown sauce, in retrospect perhaps I should have. Overall: Yes it was massive, but it was bland, lacking in meat and not generously filled all whilst being rather pricy. Gravy Factor: Like a melted down Smart Price Quiche but three times the price. I should put a caveat at the end of this by saying I love the idea of seasonal pies but the execution in this instance wasn’t very good. Hopefully next time the seasonal offering from Ibrox is more of a taste sensation and this is not merely a tick box exercise to get more money out of fans. I’m still sussing out my next review at the moment. In Faro sustenance was provided in the form a hot dog topped with crisps, it sounds good but it wasn’t and I wished there was a pie instead. I love a Tartan Army trip but so far the ‘in-stadium’ dining experiences have been a bit of a let down. These stories though are for another time so until then, go forth and eat pie! Oh, and remember to get those entries in if you think you are indeed the king of pies. This entry was posted in Football Pies, Luxury Pies, Professional Pies, Sporting Pies, The Life of Pie and tagged chicken, fitbaw, Football, ham, ibrox, pastry, Pie, quiche, rangers, scottish football, st johnstone, world scotch pie championships. Hello and welcome to the last Meat Filled Pastries of 2014. What a year of pie it has been. 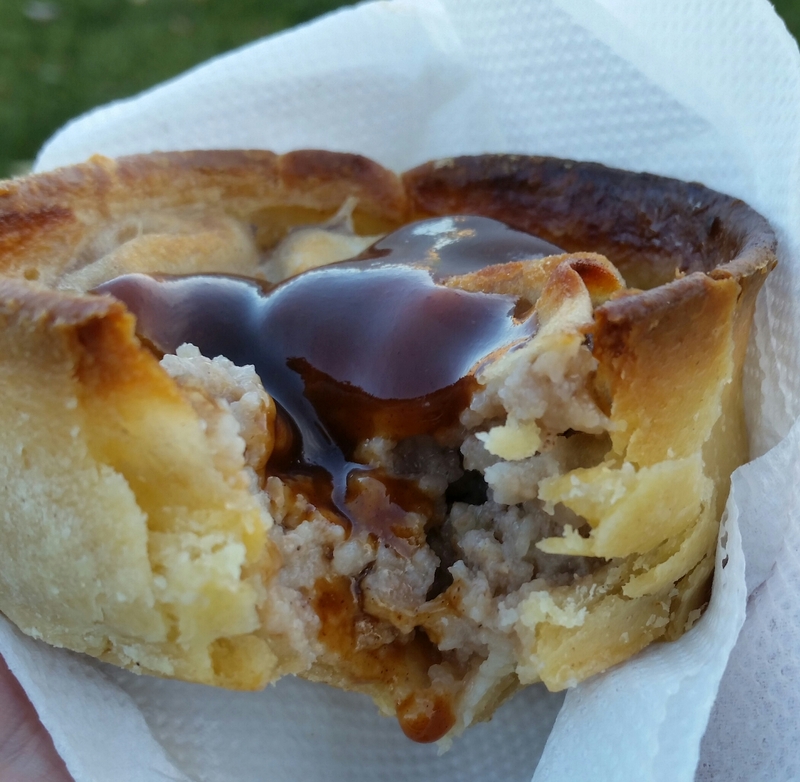 I’ve managed to score a couple of freebies, spread my gospel of meat and pastry in a couple more match day programmes and, perhaps most significantly, got my taste buds around some of the best (and worst) football pies around at the 2015 World Scotch Pie Championships Judging Day. This adventure just keeps rolling on and just when I think that the pastry laden path I meander along has made things as surreal as they could possibly be it has me hurtling down the rabbit hole like a pie starved Alice in a wonderland of mutton, mince, onion, pastry, steak and gravy. Thank you to those of you that have shared, printed, spoke about and, quite frankly, indulged me on this journey over the last 12 months. I hope you continue to do so in 2015. Sentiments aside, the reason why you are all here is to once again dive head long into a wonderfully meaty treat. So without much further ado, let’s rate some pie! 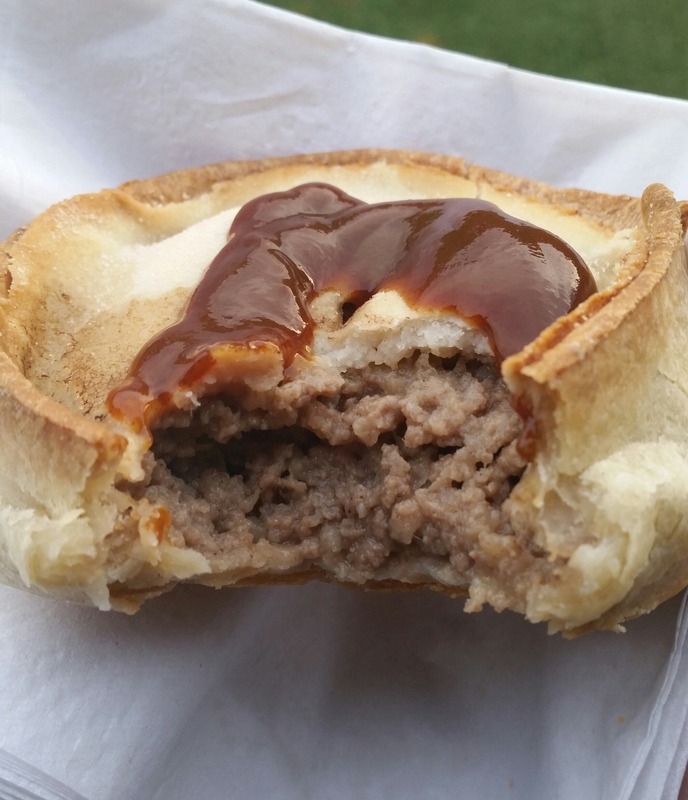 Price: Priced at £1.20 this is perhaps a little more expensive than you would expect at an Ayrshire District League ground but the good folk at Ardrossan are packing a secret as the pie they stock is none other than the 2014 World Scotch Pie Championship Winner. Therefore making an apparently premium junior price seem like a bit of a bargain. Presentation: After a slightly strange array of offerings recently it is almost fitting that the last pie of the year should not only be a champion but also presented in the ever classical medium-sized white napkin leaving the pie neither over or under dressed. You know I’ve always wondered if Coco Chanel would approve of such paraphrasing when the subject matter it relates to is so big and meaty. Meatiness: As I stared at the placard on the side of the pie stall that proclaimed the presence of a world champion pie my expectations were immediately raised. A reward for jumping in my car and seeing where the footballing gods wanted to guide me. It did not disappoint. The pie was moist but not greasy. There was a peppery hit that as opposed to being sharp and acrid was smooth and lingered long in the pallet. Once the pepper had dissipated you were left with a mutton finish that did indeed have you biting down for more. It was clear to me why this was considered a pie of the highest order. Pastry: This is going to sound a bit odd but when reviewing my notes of this pie I’ve described the pastry as meaty. As I rack my brain trying to get my taste memories past Christmas Dinner I remember thinking that the pastry had managed to retain some of the juices from its meaty insides. It also had a light buttery finish with a nice crumble and sufficient enough to hold the filling as I munched my way through. Brown Sauce: A sweet and tart offering from Spar presented in a squeezy bottle. If I’m being honest I felt the sauce, on this occasion, detracted from as opposed to enhancing the flavour of my pastry. Overall: I would have like to have tasted this pie without knowing of its prestigious history just to see if it really was as good as it appears as I can’t help but feel a blind tasting would have brought a truer review unaffected by the fame of it all. That said there is no doubting that this was a belter of a pie. Gravy Factor: King of Pies, for now. A contender for the 2015 crown we’ll have to wait and see but for now Michelin gravy. Pie 84 is where this year’s tally will end, but there is no doubt in my mind Pie 100 will come to us all in 2015. 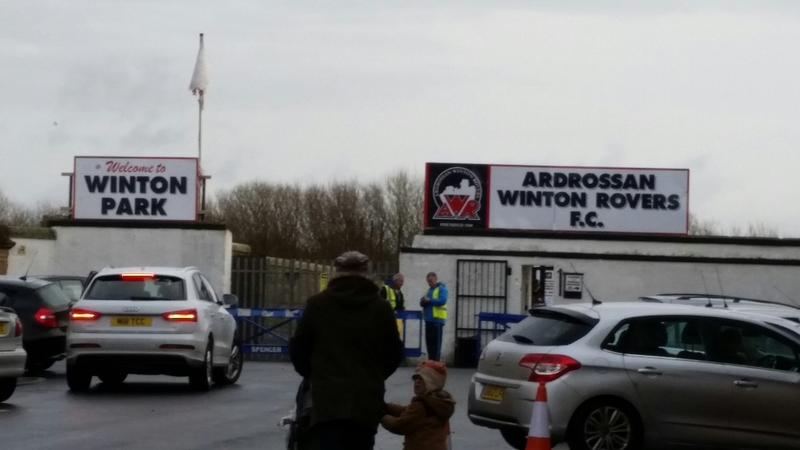 I had planned an additional review from Ardeer Thistle however they had, rather upsettingly, ran out of pies when I finally reached the front of the queue 15 minutes after kick off. 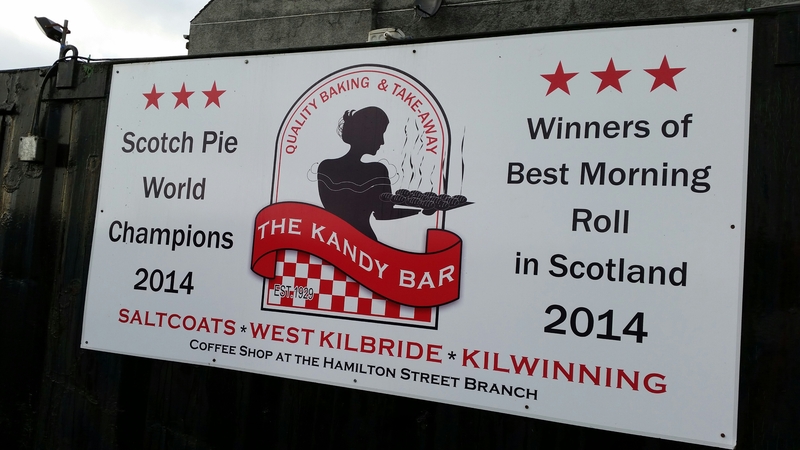 Whilst disappointed my sorrow was tempered when I was greeted with the same World Scotch Pie Championship Winner sign that had greeted me at Ardrossan just a couple of weeks earlier. I assumed they must be the same. Anyway, here’s to 2015, go forth and eat pie! This entry was posted in Football Pies, Junior Pies, Sporting Pies, The Life of Pie and tagged ardeer thistle, ardrossan winton rovers, athletic, fitbaw, Football, glenafton, Gravy, Juniors, Meat, meat filled pastries, mince, mutton, pastry, Pie, the kandy bar, west of scotland, world scotch pie championships.